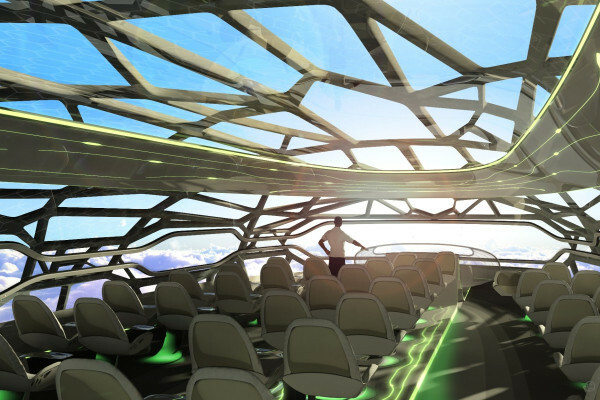 This is just one of the concepts aeroplane manufacturer Airbus are hoping to incorporate into future designs, along with biosensors, "handprinting", and cabins that are customised to the needs of individual passengers. Sounds pretty enticing, doesn't it? But how will this all work? Colin - Well, you probably start before you actually get anywhere near the aircraft, once you'VE purchased your ticket, you'd already have your details, your personal preferences on record. A lot those actually exist today. So that the aircraft and the airline know exactly what your personal preferences are. So, when you scan or have a palm print to enter the aircraft rather than just a normal boarding pass, it knows exactly where you like to sit. iT WILL have an idea of how often you want to be disturbed for example with the drinks trolley or even what sort of meals that you actually really would prefer not to have. So, we can actually build up a print of exactly what every passenger's requirements are. Where you actually sit in the aircraft might not in the future be by the relative class - first, business or economy. It could be by what you want to actually do during the flight. If you want to work during the flight, there'll be a work space area. If you just want to sleep, a sleep area, or if you just want to immerse yourself to connectivity and your own social media then there'll be a full entertainment area. Kat - The thing I struggle with and I know tall people have the opposite problem, the seats just aren't comfortable for me at all. Colin - Yes. We've conducted a lot of work with looking at morphing structures. These are structures where you actually sit on the seat and the seat then over a short period of time adopts the shape of your body. So, you don't have any particular pressure point in your posture. Kat - One of the things that we've mentioned is that the see-through airplane. To some people, that might be the most absolutely God-forsaken terrifying thing in the world. But to someone like me, I think that's cool. How would that work? How would you have a see-through fuselage? Colin - Well, we've actually got the technology around us today to create the illusion of a see-through fuselage. That would be by having small cameras around the outside of the aircraft, projecting an image directly onto the interior skin. Now, that as you say is quite a scary prospect for a lot of people. But we could take it one step at a time where we could eliminate all windows in the aircraft and just have patches of these transparencies to simulate the windows. That for us, reduces a significant amount of weight for the aircraft. Kat - I guess one of the hot topics in aviation is the amount of energy, the amount of fuel that it takes to do a flights. Is there anything that you guys are doing briefly to tray and maybe reduce the costs or use alternative and maybe less environmentally damaging types of fuels and energy source on these planes. Colin - There's a great deal of research that's being conducted on biofuels and we should say that they are sustainable biofuels. We're now cleared to have up to 50% mix of biofuel and fossil fuel and still fly. Kat - Also, you've got quite a lot of warm bodies on the plane. Could that be any use to you? Colin - It is and one of the - coming back to our seat again, we're looking at energy harvesting and that's actually taking the heat from our body to convert that into electricity and then feed that in maybe to power the interior lighting system of the cabin. Kat - I love the idea I could be sitting on a flight in the future, pairing my own TV in front of me from my own body heat. thank you. Colin - That exactly would be the case. Kat - That sounds absolutely wonderful and it could be really cool, but is this really feasible financially? How much would this kind of technology cost? Colin - The cost of technology is - this type of technology is coming down all the time. we can see a route to a lot of the technologies that we've put forward in the future aircraft and the concept cabin. Everything, quite naturally, has to buy its way onto the aircraft. We wont pay as a travelling public. We don't want to pay any more than we are today. So, the challenge we always have is not just technology for technology's sake. It's got to come at a price point where both yourself, myself, and everyone else is prepared to pay the ticket price.